Copyright BackSpace.Academy. Powered by Blogger. BackSpace is now on Udemy. Get your free access!!! Many of you have been requesting we put our courses on Udemy and we have finally listened. We are now listed on Udemy and future courses will also be on Udemy. FREE access to any existing paid members of backspace academy. Just send an email with your account details (name and enrolled email address) and we will provide you with a Udemy free coupon. We will of course continue to sell and support courses with exam engines at backspace.academy. CloudFront should be an essential component of any web based application deployment. It not only instantly provides super low-latency performance, it also dramatically reduces server costs while providing maximum server uptime. Creating low latency static websites with CloudFront is a relatively simple process. You simply upload your site to S3 and create a CloudFront distribution for it. This is great for HTML5 websites and static blogs such as Jeckyl. But what about dynamic sites that need real time information presented to the end user? A different strategy is clearly required. Much has been published about different methods of caching dynamic websites but, I will present the most common sense and reliable technique to achieve this end. If you read any book on NodeJS you will no doubt find plenty of examples of rendering Jade templates with Express on the server. If you are still doing this, then you are wasting valuable server resources. A far better option is to render on the browser side. There are a number of frameworks specifically for this, the most popular being Facebook's ReactJS and Google's AngularJS (see State of JS report). I personally use ReactJS and the example will be in ReactJS, but either is fine. Creating your site using ReactJS or AngularJS and uploading it to your NodeJS public directory will shift the rendering of your site from your server to the client's browser. Users of your app will no longer be waiting for rendered pages and will see pages appear with the click of a button. 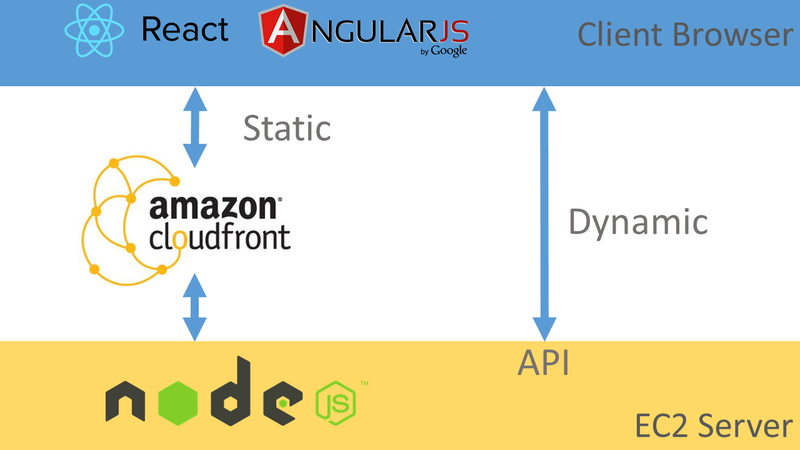 You can now create a CloudFront distribution for your ReactJS or AngularJS site. Although pages may be rendered instantly in the browser, any dynamic data required for the pages will be cached by CloudFront. We most probably do not want our dynamic data cached. We will still need a solution for delivering this data to the browser. Although there are many elaborate techniques published for handling dynamic data with CloudFront, the best way is to deliver this data without caching at all from CloudFront. Not all HTTP methods are cached by CloudFront, only responses to GET and HEAD requests (although you can also configure CloudFront to cache responses to OPTIONS requests). If we use a different HTTP method, such as POST, PUT or DELETE the request will not be cached by Cloudfront. CloudFront will simply proxy these requests back to our server. Our EC2 NodeJS server can now be used to respond to requests for dynamic data by creating an API for our application that responds to POST requests from the client browser. Some of you might be wondering why I haven't used serverless technology such as AWS Lambda or API Gateway. Rest assured I will be posting another series using this but, I consider EC2 as the preferred technology for most applications. First of all, costs are rarely mentioned in the serverless discussion. If you have an application that has significant traffic, the conventional EC2/ELB architecture will be the most cost effective. Secondly, many modern web applications are utilising websocket connections. Connections like this are possible with EC2 directly and also behind an ELB when utilizing proxy protocol. This is not possible with serverless technology as connections are short lived. In the next post in this series we will set up our NodeJS server on EC2, create a CloudFront distribution and, create our API for handling dynamic data. Be sure to subscribe to the blog so that you can get the latest updates. AWS has just released a new AWS Answers page that is essential reading for those preparing for the certification exams. It provides a great overview of AWS architecture considerations. I spend a heck of a lot of time coding and, like many devops guys, love Coffeescript, Jade, Stylus and YAML. No chasing missing semicolons, commas and curly braces. I just write clean code how it should be and, at least twice as fast. AWS just announced support for YAML with CloudFormation templates. I would thoroughly recommend you check it out and start using YAML. It will make big difference to your productivity and, your templates will be much easier to read understand. YAML, like Coffeescript, Jade and Stylus, makes use of indenting in code to eliminate the need for braces and commas. When you're learning YAML, you can use a JSON to YAML converter (eg http://www.json2yaml.com) to convert your existing JSON to YAML. Here is a full example I created for S3. I'll let you be the judge which one is better! "Description": "URL for website hosted on S3"
"Description": "Name of S3 bucket to hold website content"
Please note: You should have a link in your login for blind or vision impaired people. These techniques will prevent them from using your application. They could be accommodated using an alternative dual factor authentication process. In a real app you would set this all up using a jade template but for simplicity we will just send raw html. The first thing we can look at is the header information sent to our NodeJS EC2 instance. I conducted some tests using a number of different browsers and also using the very popular PhantomJS headless webkit to find any clear differences between a real browser and a headless browser. Below are the results. I won't put all the results here for all the browsers tested, but there is a clear structure to the PhantomJS header that is unique from conventional browsers. In particular starting with "accept" and finishing with "host". Analysing the header structure can be used to help identify a Bot from a real person. If the post is submitted then the further identification can occur. In this example we will just check the length of the plugins array and also send the filled out input fields. If it is a Bot then the wrong input fields will be submitted and the plugins array length will be zero. Additional security can also be achieved by creating multiple versions of the login file with different names for the parameters (username/password/plugins). The backend code that handles the post request would be expecting the fields defined in login file that was served. Anything different that is posted means the request is most probably a from a Bot. Another option is to serve the login.js file on the server side with random parameters and set up a route for it to be downloaded. For simplicity I won't add the extra code for this, but implementation is quite straightforward. It is quite important that you use a number of techniques to identify bots to make sure you do not have a case of mistaken identity. It is a good idea to use a score system and identify a level which will trigger corrective action. We are now building a bot score and deciding whether to allow access based on that score. The following technique needs to be used with caution. If you want to ensure the Bot is destroyed for the good of the internet community then you can look at launching a counterattack on the bot with your own malicious script to crash the browser. In my next post I will look at the different types and benefits of captcha and how to enable them on your site. We now accept PayPal and use Paypal for all transactions including credit cards (no more Stripe). Login is no longer with username and password so please login using your facebook account that is linked to the email you used with BackSpace. If your Facebook account uses a different email then please send me an email on info@backspace.academy and I will update the database with your Facebook email. Shared Responsibility 2 - Using Dynamic CSS Selectors to stop the bots. In my last post I talked about techniques to stop malicious web automation services at the source before they reach AWS infrastructure. Now we will get our hands dirty with some code to put it into action. Don't worry if you are not an experienced coder, you should still be able to follow along. How do Bot scripts work? A rendered web page contains a Document Object Model (DOM). The DOM defines all the elements on the page such as forms and input fields. Bots mimic a real user that enters information in fields, clicks on buttons etc. To do this the bot needs to identify the relevant elements in the DOM. DOM elements are identified using CSS selectors. Bot scripts consist of a series of steps that detail CSS selectors and what action to perform on them. 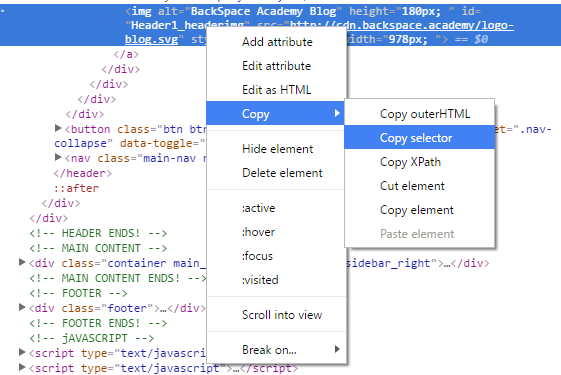 Text inside the element using Jquery ':contains'. To make life difficult to develop bot scripts you can use dynamic CSS selectors. Instead of creating the same CSS selectors each time your page is rendered, you can look at changing these randomly each time. When using NodeJS and Express this is quite straightforward as your are already rendering pages on the server. Simply introduce some code to mix this up a bit. To save you typing, the code is available at Gist (also Blogger tends to screw up code when it is published). Now let's change index.js to create a simple login form. 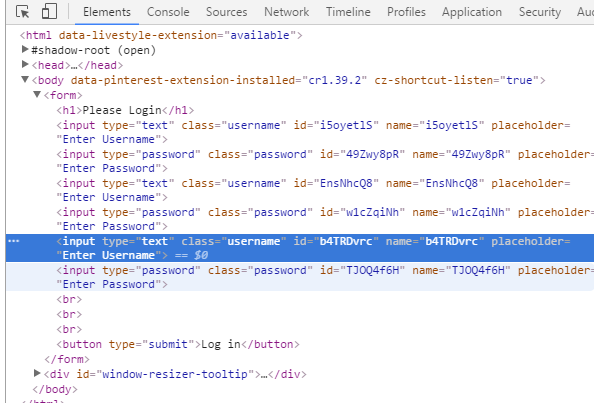 The problem with this form is that it is really easy to identify the dom elements required to login. The id, name, placeholder all refer to username or password. Now let's change our code and introduce dynamically created CSS selectors. This now generates a random string for the id and name tags of the input elements. This makes it not possible to use these in a reliable bot script. If you do npm start again and view the the view the element in developer tools you can see the random strings. We now need to look at the other ways our elements can be identified as CSS selectors. As you can see the text "username" and "password" is still used in the placeholders and input type tag. Also the DOM structure itself doesn't change dynamically, making it possible to reference the element through traversing the DOM structure. Now when you view the DOM in your browser developer tools, you can see the decoy input elements created underneath the real input element. 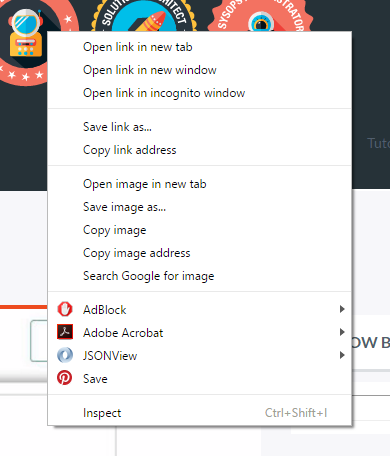 If you refresh your browser you will see a different number of elements created each time (between 1 and 5 created). The bot creator can no longer use the username and password placeholders or input types to identify the elements. They can also not use the DOM structure to traverse through the DOM as this is changing also. As pointed out by a reader of this post (thanks Vadim! ), you should also put some random inputs after to handle jquery ":last". A good place would be underneath your logo. The next thing a bot script can do is click on an x-y position on the screen. We can handle this by randomly changing the position of the elements. The position of the input elements is now random. This currently only has two positions but you can elaborate on this to create many possible combinations of positions. You may also make your login form inside a modal window that changes position on the screen. If want to go further you can look having two login forms, username followed by password. Or even better, randomly change between the two. We have now addressed the possible techniques a bot creator can use to identify your input elements and login to your site. Congratulations, you made it to the end! In my next post I will introduce techniques to identify bots and then look at launching a counter attack on the bot to crash it after it has been positively identified.